There isn’t really any disputing that Diego Reyes is the top of this list. 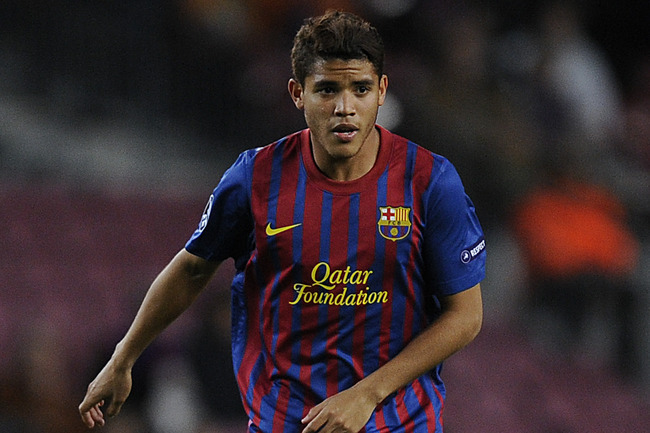 Although he is currently with Club América, he will be making the move to Portugal at the end of the Torneo Clausura. Reyes was one of the Gold medalists in London 2012, and has been playing out of his mind ever since. He made his first debut with Mexico’s senior side against the U.S. in March, and he cancelled out every attack that came his way. Diego could find himself in Brazil 2014…it may almost be absurd to think he wouldn’t be there. The most prolific player for Mexico in the 2013 U-20 CONCACAF tournament was Jésus Corona. His dribbling ability, speed, and vision caused nightmares for the opposing sides. His first major breakthrough was with Monterrey in the 2012 FIFA Club World cup. Jésus was a major bright spot for Monterrey scoring two goals in the tournament. He is already getting linked with European clubs and for good reason. If he keeps up his growth, he could make a debut for the senior side sometime soon. However, first things first; battle for the U-20 crown in Turkey. Cándido came onto the scene in the 2012 Toulon tournament in France. Mexico won the tournament, and Cándido was a major component to that team. He has since quieted a bit, but still has shown some solid talent with Santos Laguna. It will be really hard to not see him with the U-20 side when they go to Turkey. Cándido may also make his return to the Toulon tournament this summer to help Mexico defend their title. No, your computer/phone is not broken. A 16 year old indeed takes #4 in the TriReport rankings. Marco Granados put on an incredible display in the 2013 U-17 CONCACAF tournament. Granados was actually utilized as a sub and managed to score four goals and took home the Golden shoe. Marco plays with great speed and strength for a ‘kid’ his size. When Mexico travels to the UAE this fall for the U-17 World cup, don’t be surprised to hear Granados name both on the pitch and linked to European clubs. You can’t have this type of list without some love for the Goalkeepers. Richard Sánchez wraps up the rankings for many reasons. Richard was part of the brilliant 2011 U-17 World cup champion side and just recently continued his role with the U-20’s. Richard was a stonewall for Mexico and the proof is in the scoresheet. In the 2013 U-20 CONCACAF tournament, Mexico conceded only one goal. To make it even more impressive, the only goal came from a PK, which Richard actually managed to contest. He would go on to take home the Golden glove in the tournament. Mexico will head to U-20 World cup in Turkey with firepower in the attack, but also at keeper. The list was a very difficult one to create, simply due to the tons of up and coming names. However, these 5 players make up our top 21 and under players for Mexico. Let us know what you think. Who do you think should have made the list?